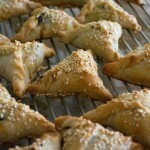 I baked pastelicos today in my frenzy of preparation for the upcoming Rosh Hashanah celebration. They freeze and reheat well and it just wouldn’t be a holiday without them. I have posted this recipe before but it is worth posting again. 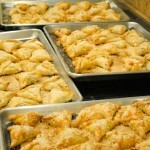 Pastelicos are triangular borekas with a savory meat and rice filling. 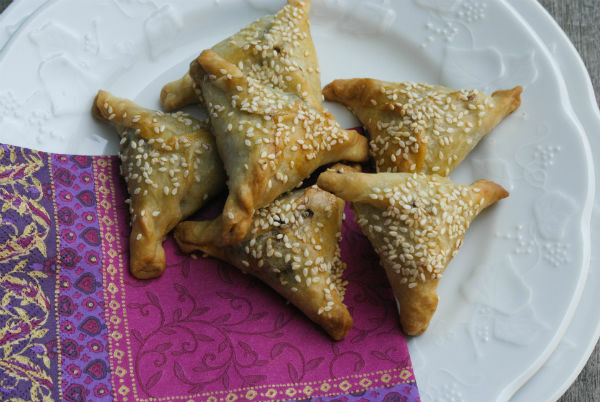 As with other Sephardic pastry, you can find versions in different shapes, with different dough and different spice blends. This is the recipe my mother always made. A Pastel is a pie in Ladino or Judeo Spanish, and these individual small ‘pies’ use the suffix indicating smallness. Crispy, savory, and beautiful, they are great hors d’oeuvres for parties and special holiday dinners. 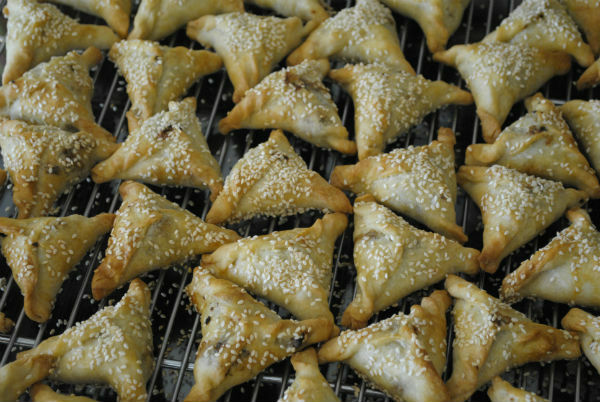 I always make them for Rosh Hashanah, Jewish New Year, and Sukkoth, Feast of the Tabernacles. Be sure and count more than one per person when planning how many to serve. The filling amount is for two batches of dough. Make the dough recipe twice. 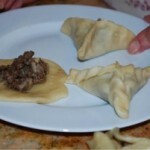 I make one recipe, fill and bake the pastelicos and then, I make the second recipe of dough to finish the filling. The filling is best made the night before and refrigerated. Heat a large sauté pan until over medium high heat. Add oil and then, onions. Occasional stir onions with a two wood spoons, sautéing on medium heat until sweet and golden. Push onions aside, add ground chuck and sauté until browned and starting to stick. As you stir onions and chuck meat, break it up with your spoons so it becomes crumbly with no large chunks of ground meat intact. Next, stir in parsley; and season with salt and pepper. Add uncooked rice into meat and onions. Add just enough water to barely cover mixture and place lid on pan, about 1 cup. Reduce heat to low, cover, and let steam until all water is absorbed and rice is cooked, about 15 minutes. Cool filling down before using, I recommend refrigerating overnight in a covered bowl. For dough, measure flour into medium bowl and add salt. In a two-cup glass measuring pitcher, combine ice cold water and oil. 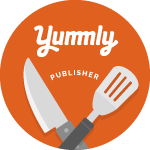 Beat liquids with a small whisk to emulsify. 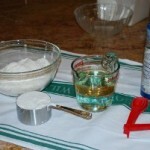 Pour liquid into flour and stir with a fork. When dough holds together, use your hands to finish gathering dough into a ball. 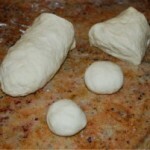 All flour will incorporate and dough should be soft and pliable. Separate dough into 42 walnut size pieces. Roll each small piece into a smooth ball. With a rolling pin, roll each ball into a circle, no larger than 3 inches in diameter, taking care not to go over the edges with the rolling pin and make them thin. Heat oven to 400° F and line 4 rimmed baking sheets with silpats or parchment paper. 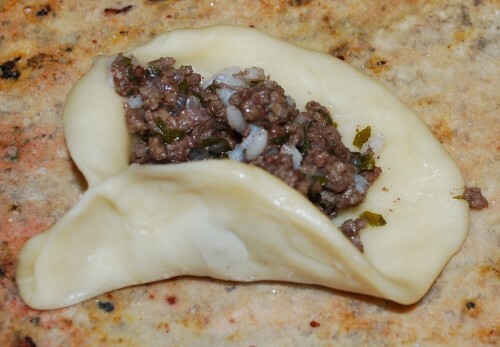 Place a heaping teaspoon of filling in each circle. 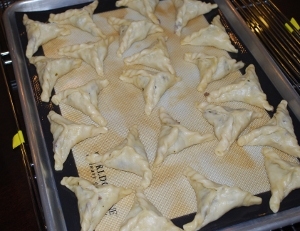 Close filled circles by folding dough in a triangle shape. Place pastelicos on baking sheets. Brush Pastelicos with beaten egg and sprinkle with sesame seeds. Bake until golden and crispy about 15 to 17 minutes. After Pastelicos cool, they keep well for two days in the refrigerator or I freeze them in airtight containers. Reheat in a 300° F oven for 10 to 15 minutes to re-crisp. I just finished making this delicious treat!!!! They came out with such a nice crispy dough. We have lots since somehow I had enough filling to make 3 batches of dough. We will enjoy!! !